The invitation from Tim â€œBlind Muscatâ€ Patterson was a two-part, April Fool’s proposition. 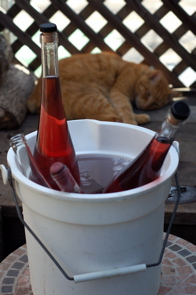 First, we’d get to help him bottle a batch of rosé, a mongrel mix of this year’s Malbec, Syrah, Cabernet Franc, and Zinfandel. Then, there’d be the festive unbottling of the selfsame wine. What better way to celebrate Subterranean Cellars’ acquisition of water and electricity? The expansion of the patio and the recent arrival of a BBQ rig were additional excuses for an all-day drink-and-eat-fest. Though far from a wine expert, I knew I’d be there when I read the menu’s magic words: pulled pork. 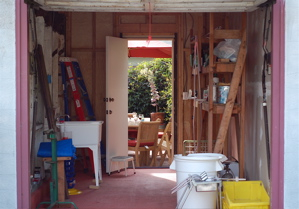 The newly equipped premises of Subterranean Cellars, with a peek back to the just-assembled patio table. 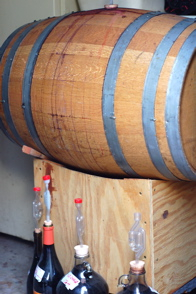 A barrel of Mourvedre sits patiently in the laundry room. On Sunday morning a crew of bottlers arrived early. Long before gospel hymns swelled from the church across the street, all the bottles were filled, corked, capped, and labeled. 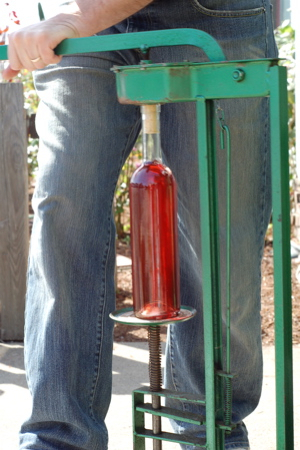 Out on the driveway, three cases of wine receive corks the old-fashioned way. 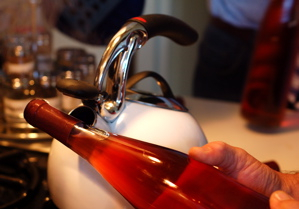 With corks securely in place, the bottles then head to the kitchen’s high-tech steaming device for capping. 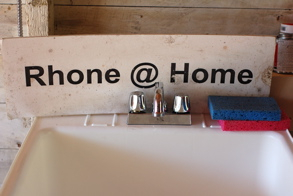 In the dining room, those with sharp eyes and steady hands affix the labels. 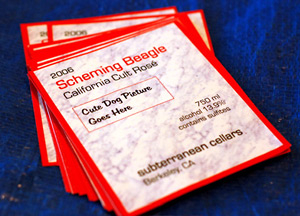 â€œScheming Beagleâ€ has its own cult following. A few bottles are removed from the production line. Roughy keeps watch over them as they chill. 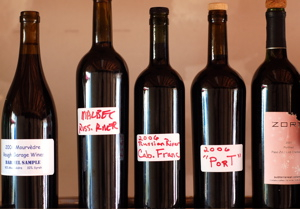 Through the day, we enjoyed barrel samples of the Malbec and Cabernet Franc, some Riesling, and Roger Campbell’s amazing Mourvedre-in-Progress. A taste each of the 2006 Port and the heady Zort (Zinfandel Port) pretty much put me over the top, so I sat in the kitchen alone with the potato salad until I felt myself again. Overstuffed and inebriated, the official photographer of the event managed to miss documenting much that was worth remembering: the fat, glistening shrimp hot off the grill; the gorgeous salad of watermelon radish and sunchokes; plates upon plates of deviled eggs; and the pulled pork in all its tender glory. 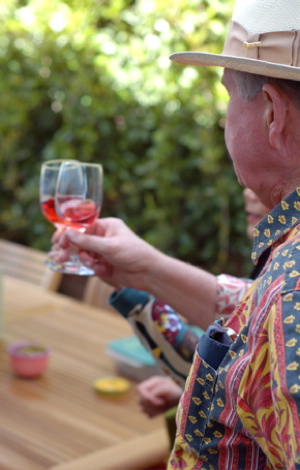 Blind Muscat leads us in a toast to sunshine and wine. A well-laid buffet never requires guests to put down their drinks. 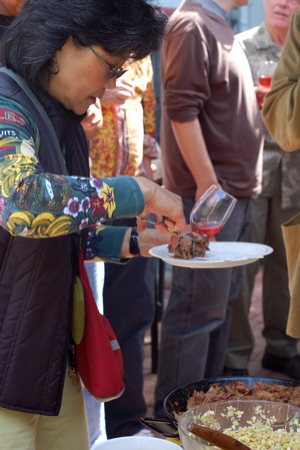 Guests were as well-mixed as the grape varietals. Color theorists traded cookie techniques with psychologists, Pilates instructors held forth on root vegetables, and investment experts shared pie with graying revolutionaries. Yes, we were in Berkeley. Driving back across the bridge, I remembered why I settled here in the Bay Area. There are other places for enjoying food, from the hawker stalls of Singapore to the routiers of Provence. New York has its fine service, and New Orleans its exuberance. What ties me to Northern California, though, are how much people here like to cook, always experimenting with ingredients and techniques in their own kitchens, and how generous people are in welcoming new friends to their homes and tables. Finding good food is easy. Finding food shared with an open heart is true treasure.